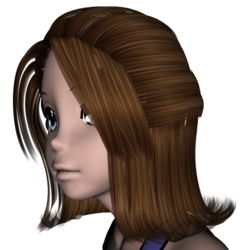 Sylwester Hair is a short hairstyle with a wave, designed by Mark003 for Victoria 4. "Sylwester Hair 2.0" is a mesh update; you will need both versions of the hair in order to use the hairdo. Sylwester Hair Expansion adds fits for Aiko 3, Cookie, Deco, Decoco, G2 Sydney, The Girl 3, Kids 4, Kururu, Laura, Little One, Maddie, Mavka, MayaDoll, Miki 3, Nana, NearMe, P4 Female Posette, P6 Jessi, Stephanie Petite 3, Toon Girl Sadie, Sara, Scampixie Pranx, Skye, Terai Yuki 2, and Victoria 3. It is available from ShareCG or Renderosity Freestuff. HairRefits_G2F_Pack2 refits a half-dozen hairdos, including Sylwester Hair, to Genesis 2 Female and Victoria 6. It is available from ShareCG or Renderosity Freestuff. This page was last edited on 6 January 2018, at 21:06.